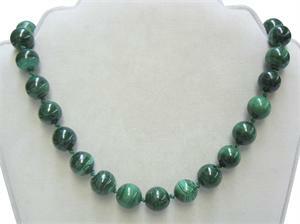 Item: #DB-2823: 18" long 12mm round Malachite Bead Necklace with Sterling Silver lobster claw clasp. Item: #DB-2723: 17" long Necklace of 14mm round Malachite Beads with Sterling Silver spring ring clasp. Item #SC-TPMA-18-X1: 14Kt. Yellow Gold Tie Tack with 10mm octagon Flat Top Malachite Cab; clutch back. Item #SC-ERMA-0343: 14Kt. 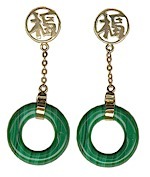 Yellow Gold Dangle Earrings with Chinese Characters and two 16mm Malachite Donuts; Post Backs.